I am so sorry. 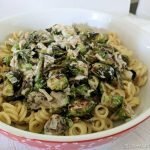 I know that you guys look to me for all things Brussels Sprouts and it has been an entire SIX months since I have posted a recipe using those Heavenly little balls of cabbage. Shame on me. If you guys can just give me another chance, I have an awesome recipe for you today. And easy. 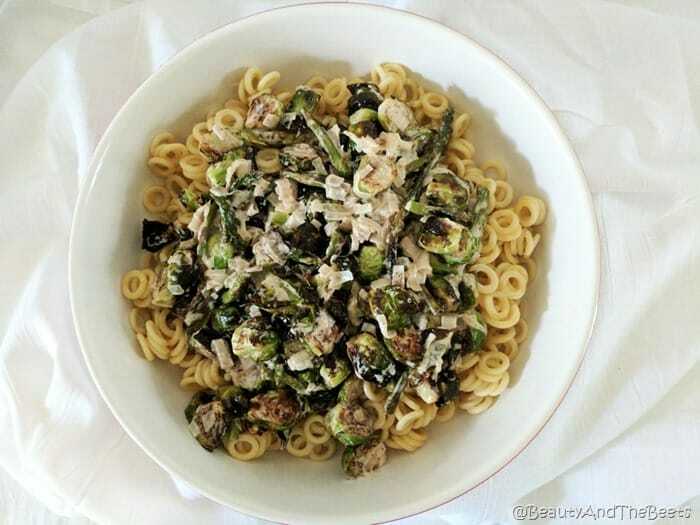 This Creamy Brussels Sprouts and Asparagus Pasta has only 6 ingredients, including the pasta. The vegetable sauce comes together in about 12 minutes, the same amount of time it takes to cook up some pasta. The veggies can be roasted ahead of time and set aside until ready to use and reheat with the sauce. So in full disclosure, this isn’t the healthiest of sauces, mainly because I used half and half. 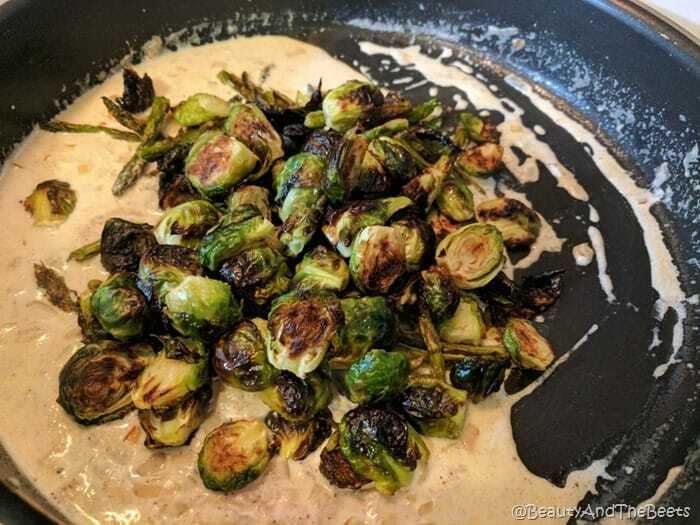 I tried twice to make this sauce with buttermilk, as buttermilk has less calories and fat than half and half, but buttermilk curdles very easily when heated. However, if you choose to use a non-dairy milk in place of the half and half, I highly recommend you steer clear of soy milk or soy cream as the curdling factor is high due to the acidic nature of the soy. And certainly stay away from the sweetened nut milks, you want the nutmeg to be the only sweet ingredient here. And the nutmeg flavor is very subtle. Have you ever tried to add just a pinch of nutmeg to red pasta sauce? Oh boy, it is delicious. And nutmeg is a traditional staple in white parmesan sauce, only in this instance I did not include any cheese. Truthfully, this recipe doesn’t need cheese. I am a cheese hoarder and I didn’t miss it. 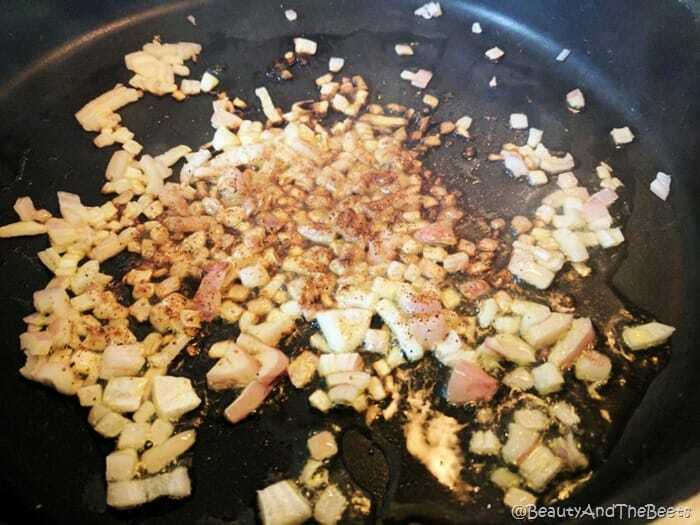 I also used a shallot instead of an onion as shallots are not as pungent. Shallot works well with nutmeg. 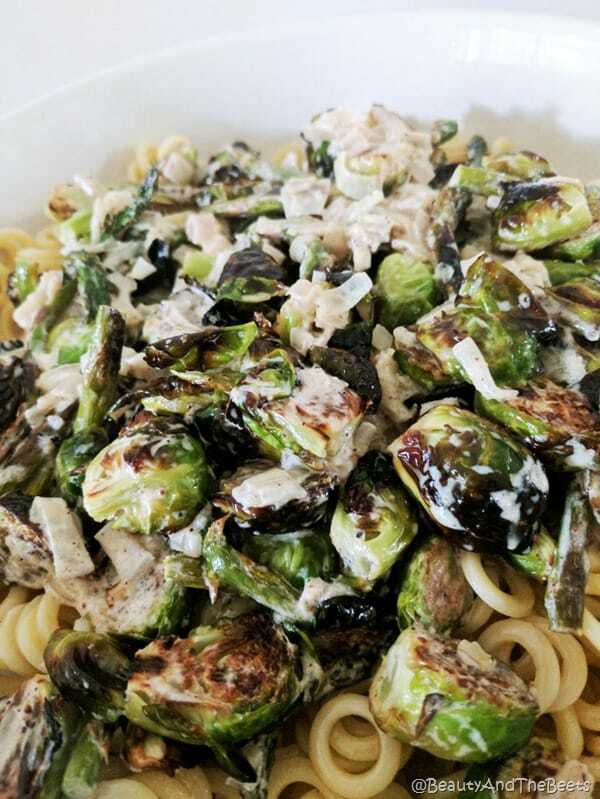 As far as the vegetables go, I used Brussels sprouts (because why wouldn’t I) and asparagus, but broccoli, carrots or even cauliflower would work well. The one veggie I wouldn’t recommend is tomato. A tomato has many juices that would interfere with the shallot and nutmeg flavor. I love easy recipes that are completely versatile. A simple and adaptable base recipe can be used over and over without becoming overdone and boring. And while the sauce is pretty straightforward, it is super easy to swap out the veggies or pasta. Switch out the pasta for rice. Even cauliflower rice would be amazing. Leave me a note in the comments of how you changed this dish up and what your family loves. 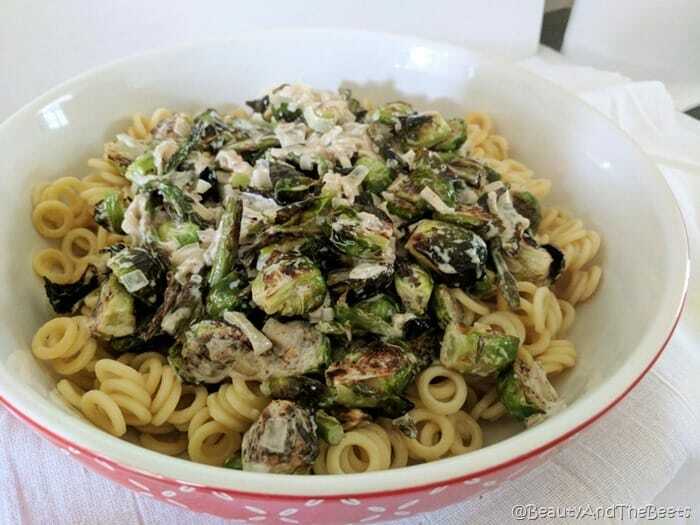 Enjoy this Creamy Brussels sprouts and asparagus pasta! Preheat the oven to 450° Line a large baking sheet with parchment paper. 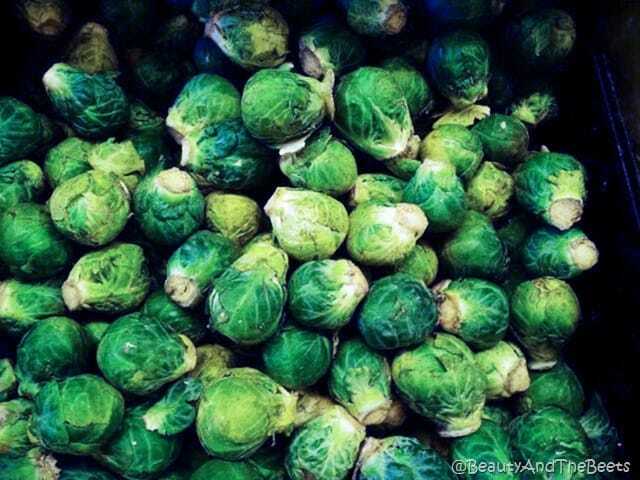 Remove the outer leaves on the Brussels sprouts and cut each sprout in half. Cut the woody stems off the asparagus and toss. Cut the remaining asparagus stalks into 1-2 inch pieces. Line up the Brussels sprouts and the asparagus stalks on the baking sheet in one layer. The less touching among the veggies the crispier they will be. Spray the veggies with the oil spray, no need to saturate. Roast the veggies for about 15 minutes, until both the Brussels sprouts and the asparagus are browned (but not burned). While the veggies are roasting**, fill a large pot with water and bring to a boil. In a large saucepan, heat the unsalted butter over medium heat. Add the minced shallot and nutmeg. Stir often for about 7 minutes, until the shallot becomes fairly translucent and fragrant. Add the half and half cream and immediately reduce heat to simmer. Cook the sauce for 5-7 minutes, until the cream begins to reduce, stirring occasionally. Drain the pasta when cooked and add to a serving dish. Remove the veggies from the oven and add to the sauce, stirring to coat. Pour the veggie sauce over the pasta. **You can roast the veggies ahead of time as they can be reheated once added to the sauce.